Missionary Oblates JPIC in partnership with the local catholic community in Tijuana, Mexico launched a hospice vegetable in Albergue Las Memorias A.C. Tijuana is a city of 2.2 million people and La Morita Colonia, where the project is launched, is one of the most impoverished and fastest growing neighborhoods of 300,000 people. The Albergue Las Memorias (Hostel of Memories) has been operating for the last 12 years as a residential hospice facility and the only one of its kind in Tijuana. It provides care and a safe place for approximately 130 indigent men, women and children infected with HIV/AIDS and tuberculosis. Many of the residents have been rejected by society and abandoned by their families. Albergue Las Memorias gives patients shelter, medical attention, and if it comes to that, a place to die in dignity. It also gives them an incentive to avoid drugs and alcohol if they have an addiction. 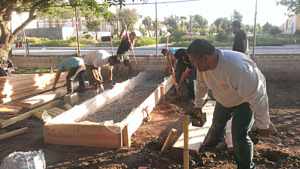 Missionary Oblates of Mary Immaculate has been working in La Morita, Tijuana, Mexico since 1996. Oblate priests work at San Eugenio de Mazenod Parish, serving La Morita’s residents and managing about 14 sites or chapels, Alberque Las Memorias being one of them. The Oblates are involved in celebrating Catholic masses, confessions, visiting people at their homes, especially the sick, etc. At Albergue las Memorias they provide support by celebrating masses, confessions, funerals and help with food at least once a week. The San Eugenio Parish’s territory covers about 7.5 square miles. The parish has ministered to thousands of the more than 300,000 men, women and children who live in the Colonia La Morita and surrounding areas, on the outer edge of the city of Tijuana. 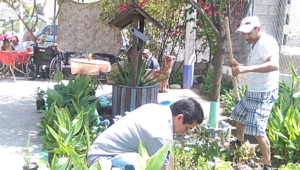 After several visits to the residents and community at Albergue Las Memorias, Missionary Oblates JPIC identified the need for a hospice vegetable garden. We believe this local supported imitative will empower vulnerable populations, helping them lead ‘dignified lives regardless of their physical, mental or psychosocial limitations.’ Young residents make up a significant number of the facility’s population. The garden will provide fresh and reliable food, greatly needed for the many patients: the shelter often struggles with having enough food for everybody. The plan for the vegetable is to start producing enough food for residents, and eventually surplus will be sold in the community. Profits from the sale of produce will fund the upkeep of the facility. To fund the project, Missionary Oblates JPIC initially pursued foundation grants but had no success. Believing in the facility’s vision, we reached out to groups at an Oblate parish and other interested individuals. “Families for Life” and “Projection Ministry of Santa Rosa” were among the groups that provided financial support. From Santa Clarita, C.A. families forming the movement “World Marriage Encounter” also donated to the project. 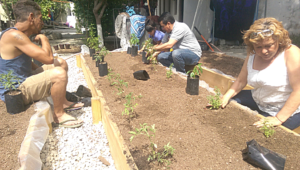 While some gave financially, others volunteered their time to work on the garden. Able-bodied patients at the shelter also helped. We are very grateful for all those who made this initiative a reality. We ask that you keep the Hospice Vegetable Garden Initiative in your prayers and stay tuned for future updates on progress. We are thankful to those who have taken a stand by supporting and contributing to these vulnerable people at the hospice in Tijuana. If you would like to support this project please visit this website.